This last week was the 10th anniversary of Knights of the Old Republic. I wanted to talk today about some of the things I loved about that game and what it meant to me in the grand scheme of things. KOTOR was my first RPG. I know what you are thinking, “Geld, you can’t be serious! There were so many RPGs before KOTOR.” I know that, but you have to think, I was only 14 when this game came out. I had played other games, like the Jedi Knight series, X-Wing Alliance, and some text based games. I never played table top games. KOTOR was my first foray into the realm of RPGs and stats and builds and so forth. So I did what I always do with new games; I read the book. The manual. I learned about Dexterity, Strength, Wisdom, etc. I learned about companion characters, about queuing skills, about talents and skills, and about gear slots. I learned that I really, REALLY liked RPGs. So to this day, I thank KOTOR for giving me the first taste of what I would find again in WoW, LOTRO, SWTOR, GW2, etc. It made me realize that video games wasn’t all about shooting things and running around with my gun pointed straight up at the sky (also known as me playing Halo or 007: Goldeneye at a friend’s house). It made me realize that there are “thinking-man’s” video games, where you can do math and be rewarded by being awesome. Where you can tweak your stats and become a Force Waving, Force Storming machine, who never runs out of Force power and never gets injured. Or if you tweak them just right, you one-shot everything with your dual-lightsabers, because they have sick and awesome crystals with just the right combination of stats. KOTOR also had something I hadn’t seen before in a game. It gave me the option to say things. I could pick my responses. This was completely new to me, as I had played the on-rails games of Jedi Knight and X-Wing Alliance with no story interaction from me. This was something I really liked about KOTOR; I felt like I could make a difference in the game’s progression. Plus, Bastila was hot, and I was a 14-year old with no girlfriend. Getting to hit on her if I wanted to was frankly enough for me to call it my favorite game ever. But seriously more than that, I really did love the story. The major plot twists, the fascination I held with the Sith and the Jedi. It all grew a lot in that game. There were questions I loved to ask after KOTOR II. What happened to Revan and the Exile? Where did they go? What did G0-T0 mean when he talked about Revan “preserving the infrastructure of the Republic against a greater threat?” I had no idea what would come next but I eagerly waited for KOTOR III, which came in the form of my current MMO, Star Wars: The Old Republic. I want to do a little bit more reminiscing about KOTOR though. For one, I remember my first class was a Scout. Why a Scout? I liked that you got the implants for free. I thought that might come in handy. Plus, since I didn’t really know what I was doing, I thought it might be good if I split the difference between the Soldier and the Scoundrel. When I became a Jedi, I went with Consular. I thought that using Force powers would be cooler than primarily focusing on the lightsaber. I absolutely was right, as I could Force Wave and Force Storm entire rooms of enemies into submission with ease. It was a blast. Literally. The second time through, I had this idea that I would not level at first if I could help it. I would wait until I finished Taris and became a Jedi, so I could get more Force powers. I went Soldier to have a little bit more combat ability right off the top and managed to get off Taris at only level 4. 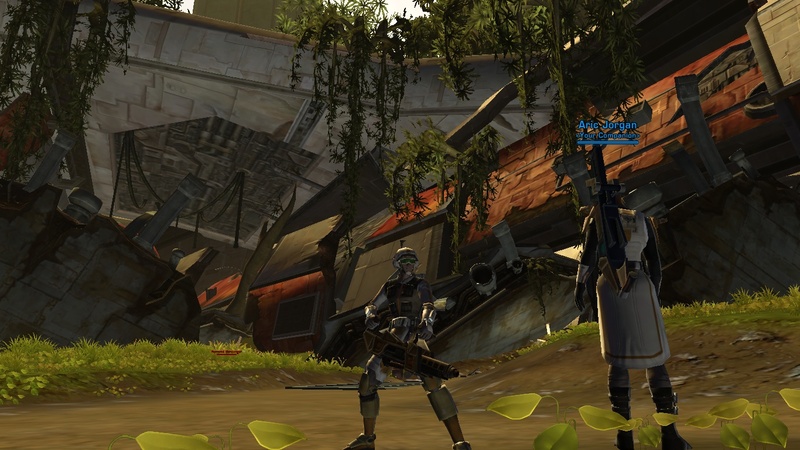 I then leveled four or five times when I was a Jedi, already starting with a lot more under my belt. When I first realized who Revan was, I flipped out. I thought it was the coolest plot twist ever. Freakin’ movie-worthy. I took the Dark Side points hit and did some work for the GenoHaradan. I solved the Dantooine murdered settler quest and the Manaan murder mystery with Sunry. I had a huge cargo of Gizka and reunited the Mandalorian stowaway with her real family. I fell in love with HK-47, and we were best buds, despite me trying to save people and him trying to eliminate them. Overall, the love affair that I had with KOTOR traveled with me to the later titles I played, enduring with me all the way to SWTOR where in the Jedi Knight story I finished what I had started with Revan in KOTOR. I saw Revan and the Exile in flashpoints, and my Imperial characters all have the Revanite title, even if they aren’t always wearing it. Even my bounty hunter remembers back to Revan’s ally Canderous Ordo/Mandalore the Preserver, who started as a soldier of fortune and ended up a king of warriors. Also, how could I forget Jolee Bindo?!? One of my favorite companions. He was hilarious! Here is a video of his best funny moments! My favorite is at 0:20. Best line ever. Ignore the fact that he looks like Yoda, that is a mod, but it was the only compilation version I could find.